Made from gold or platinum and famously worn by President Dwight Eisenhower and other world leaders, the Rolex President Day-Date line is established as a symbol of influence, power and status. 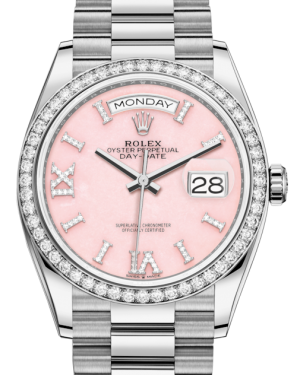 Designed as a calendar watch, the original Day-Date I was the first watch of its type to display not only the date, but the day in full on the dial. Further technological improvements then followed with the release of the Day-Date 40, which perfectly blends design elements from its two predecessors, while embracing up-to-date aesthetics. 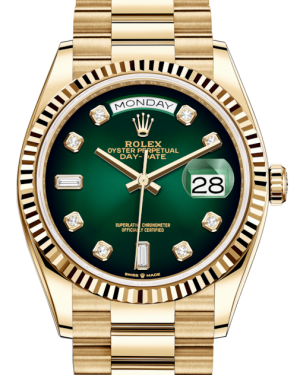 Due to their iconic appearance and unique place in history, Rolex President Day-Date watches are among the most popular pre-owned and vintage watch models around. 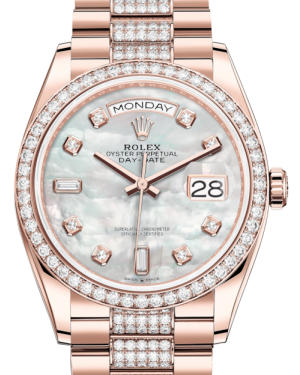 Regarded as one of the flagship Rolex models, the Day-Date is recognised as the first wristwatch in the world to display both the day and date in full on the dial. 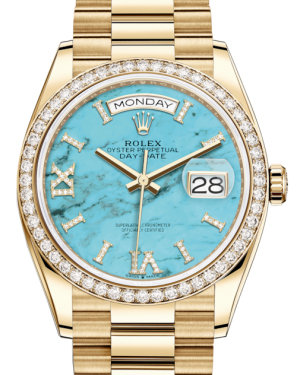 It is extremely popular with collectors, features a distinctive bracelet and is one of the few Rolex models to be available exclusively in 18k gold or platinum. The popularity of the collection was boosted by the world leaders who owned and wore a Rolex Day-Date. Indeed, it is believed that Marilyn Monroe bought President John F. Kennedy a Day-Date for his birthday, while one was also gifted to President Dwight Eisenhower by Rolex. As a result, it has been nicknamed 'The President'. 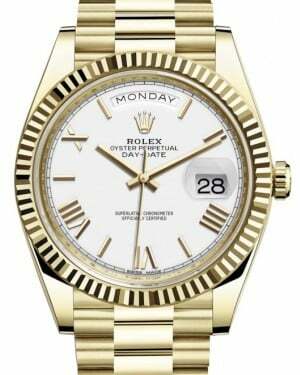 Released in 1956, the first ever Day-Date model, officially known as Reference 6511, remained in production for only one year before it was updated. Nevertheless, it was notable for its use of an automatic movement, which meant the watch had a much bulkier appearance than many of the other models around at the time. The Reference 6511 was soon replaced by the Reference 6611, which was visually identical to its predecessor, but featured an updated calibre 1055 movement. At the same time, it became the first timepiece to be receive "Superlative Chronometer" certification, complete with a reference to that fact on the dial. 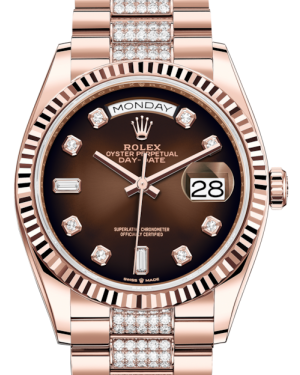 Early Rolex Day-Date models featured a 36mm case, which remained a staple of the collection for many decades. 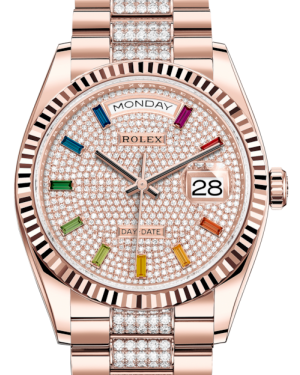 Models were exclusively constructed from valuable materials, with buyers having a choice of either white gold, yellow gold, rose gold or platinum, helping to add to the desirability of the watch. There are also many models with diamond bezel or diamond dial markers which add brilliance. An updated model, known as the Reference 1803, was introduced in 1958 and a few minor improvements were introduced gradually in the years that followed. In 1969, the President bracelet, for example, was updated with a concealed clasp, which helped to boost the popularity of the entire collection. 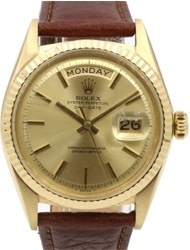 Three years later, in 1972, Rolex introduced a 'hack' feature for the second hand. Essentially, this allowed the user to stop the second hand when setting the time, allowing for far greater time setting precision. Before the end of the decade, the Reference 18038 was released and this introduced a 'quick set' feature, which allowed the date to be changed without having to manually wind forward the time on the watch. This was coupled with the addition of a sapphire crystal, enhancing the model's appearance and helping to make it more durable. 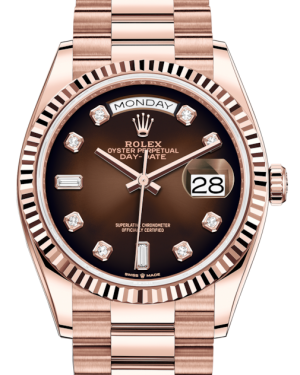 In 1990, Rolex brought the Day-Date into the modern era with the release of the Reference 18238. 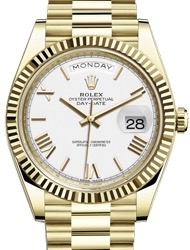 This model was notable for the introduction of a 'double quick set' function, enabling users to change both the day and date display with the same button. Then, in 2000, the company strengthened the President bracelet with solid links. 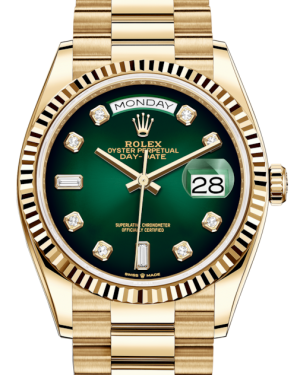 Marking the company's 100th anniversary in 2008, the company unveiled the Rolex Day-Date II. The model retained many of the distinctive features associated with the collection, with the most obvious change being the increase in case size, with a 41mm diameter making the new collection bolder and more in-keeping with modern trends. 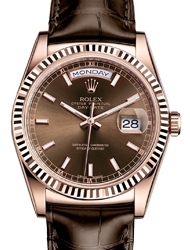 In 2013, the manufacturer launched the latest 36mm models, which consist of References 118138, 118139, and 118135. These timepieces come with the additional option of a leather strap, are fitted with the calibre 3155 movement and offer superior shock resistance. Moreover, the day display is available in a total of 26 languages.